Take a nostalgic journey to the incredible summer of 1967. The Summer of Love anniversary concert is a celebration of the flowers, psychedelia, freedom, peace, love and a whole host of unforgettable music that inspired a generation. The summer that became one of the most important cultural moments in history. 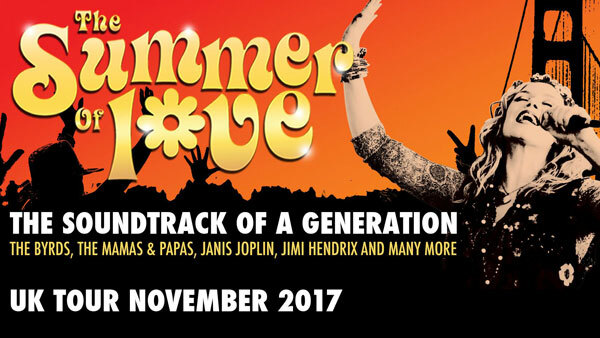 Featuring original footage captured in the era, The Summer of Love blends film from the defining decade with a full live band to create a phenomenal performance of hits, such as ‘California Dreaming’, ‘San Francisco’, ‘Turn Turn Turn’, ‘Somebody To Love’, ‘Happy Together’, ‘Brown Eyed Girl’, and over forty more classics from the sensational summer. The 1960’s proved to be a turbulent, political decade, and one of many changes. These struggles had a lasting impact on the decade, and are an important part of the show. Events such as Haight Ashbury, Vietnam, race tensions in the states, experimentations with drugs, youth culture and the draft are respectfully covered within the show. The tour, produced by Maple Tree Entertainment Ltd, opens at the Octagon in Yeovil on November 2nd and takes in 23 major theatres in towns and cities across the UK.